18th-century Britain's passion for porcelain. I confess I have not read Battle Hymn of the Tiger Mother, only excerpts and several astute reviews. Those reviews (Annie Murphy Paul in Time, Elizabeth Kolbert in The New Yorker) suggested that American readers' heated responses to Amy Chua's parenting polemics are not merely another volley in the mommy wars. They are also emblematic of increasing fears about China, about the threats to U.S. power that Chinese economic and military strength may presage. Intertwined in Americans' intense reactions to Chua are our feelings about American political might, about mothering, and about the Middle Kingdom. If, say, a Scandinavian American had written the same book she might not have received death threats. This is not the first time that Westerners have conflated arguments about gender, anxiety about international trade, and fantasies about Chinese culture. 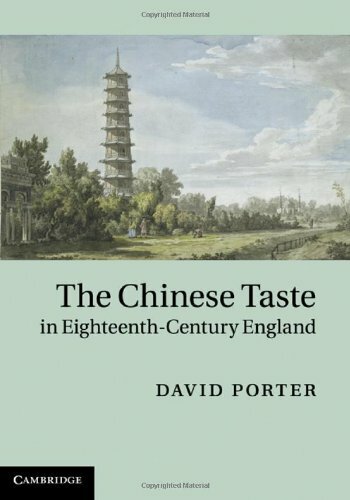 An ingenious new monograph by David Porter, professor of English and comparative literature at the University of Michigan, explores the significance of Chinese decorative arts in 18th-century England. It turns out that the English conducted many serious social and political debates in the idiom of Chinese porcelain. Ming and early Qing porcelain (and, eventually, English knockoffs thereof) was wildly popular in 18th-century England. Queen Mary had inaugurated the craze in the 1690s, filling her rooms at Hampton Court with blue and white vases and plates. Élite and middling Englishwomen followed her lead. By the mid-1700s, no mantle was complete without a Chinese jar, a laughing Buddha. As these Englishwomen (and, crucially for Porter, it was largely women) snapped up Ming pots, critics picked up the pen to denounce the chinaware. One mid-century commentator derided Chinese porcelain as "monstrous offspring of wild imagination, undirected by nature and truth." A "mean taste runs through" Chinese art, wrote Hogarth. It was garish; too colorful; not truly beautiful, but merely sensuous. Part of porcelain's appeal, Porter argues, was tactile and sensory. Compared to the somber wooden and pewter vessels English men and women were accustomed to using, porcelain was "astonishingly smooth, bright, colorful, and translucent." Porcelain vessels were also resistant to heat, and relatively easy to clean. But the lure of Ming and Qing porcelain went beyond those formal properties. Uncovering teaware's cultural significance requires consideration of the trade practices that brought Chinese goods to English shops. Porter reminds us that "China in the early eighteenth century was no British colony, nor was it in any plausible sense in the process of becoming one. The foreign trade in Canton was conducted entirely on Chinese terms, under conditions that the British found deeply humiliating but were in no position to change." Because the Chinese weren't interested in English goods, the East India Company financed its purchase of tea and porcelain not with crates of woolens, but with silver bullion; many contemporaries thought this was advantageous to the Chinese. (Sound familiar?) So when an English tea-drinker picked up a porcelain cup, he didn't feel the satisfactions of empire. If anything, he might have felt ill-at-ease, since the cup from which he sipped was a synecdoche of a worrying economic arrangement. Porter finds the meaning of Chinese porcelain not only in the context of international trade patterns but also in relation to changing social mores in 18th-century England, a period during which ancestry, which had long dictated English social arrangements, was being eclipsed by new money. In the Elizabethan era, when an upwardly mobile family had to wait five generations before gaining admission into the ranks of the nobility, English men and women prized old goods—they wanted silver with patina, portraits that announced pedigree. But in the 1700s, men and women increasingly valued "luxurious novelty." Chinese goods became popular just at the moment when a modish French bibelot might—or might not—have more cultural prestige than an heirloom. A piece of Ming porcelain, Porter suggests, was able to satisfy both the longing for antiquity and the cravings for newness: certainly, to the English eye, blue and white porcelain was novel, but it was "novelty with a four-thousand-year-old lineage." Thus a "sinophilic antiquarianism" began to shape English taste and English domestic space. That Ming vase seemed at once reassuringly establishment, and cunningly recherché. For want of sources, many scholars would have abandoned the inquiry into the cultural meanings of the China craze mid-course—as Porter notes, the British Library doesn't own a cache of diaries in which 18th-century English consumers ruminate at length about just why they love porcelain cups. But Porter is stubborn, and imaginative, and does not let the dearth of chatty diaries deter him. Instead, he juxtaposes written texts and material artifacts, and he inventively reads anti-porcelain diatribes for the clues they might contain about what drew purchasers to porcelain. For example, he notes that in a satirical newspaper article, Joseph Addison takes aim at the "great Jars of China," "Tea Dishes of all Shapes Colours and Sizes," and "thousand … odd Figures in China Ware" that he ostensibly encountered in a rich widow's library. While sneering about the porcelain, Addison also dismisses the French romances that lined the widow's library shelves.